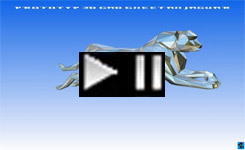 • Development Steel Plastic "Gear of Time"
CULTURE STATION Bad Bevensen registered association. Steel plastic gear wheel of the time approx. 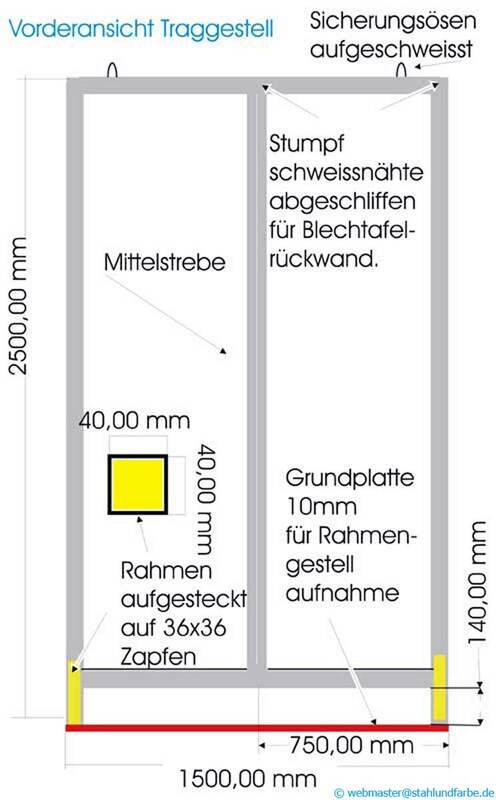 4x4 meters material: sheet steel & mounting iron. Statement: Our work is a critical appeal to agro-genetic engineering to radically transform the genetic material in agriculture. 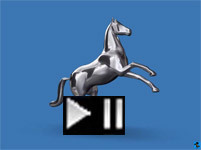 Symbolized by the farmer driving a team of horses pulling a gear plough. The gearbox of the gears automatically consumes the young plants. The observer should be confronted with the automatism of agro-genetic engineering progress. Whether under the umbrella of the rainbow, symbolic of positive feelings, harmony and wholeness, the farmer leaves indelible traces for man and nature with the genetic plough. Statement traces: In the last century, 75 percent of cultivars in our agriculture have already disappeared. Are we continuing to follow in the footsteps of a monopolised monoculture through the development of genetically modified plants and animals Synthetic Genome Technologies in the course of progress? The greed for profit of global corporations exposes man and nature to uncontrollable risks, with ultimate consequential costs for society as a whole. • Development contract work "Alfa Romeo Design glass table". Commissioned work Alfa Romeo Design glass table in the working process. 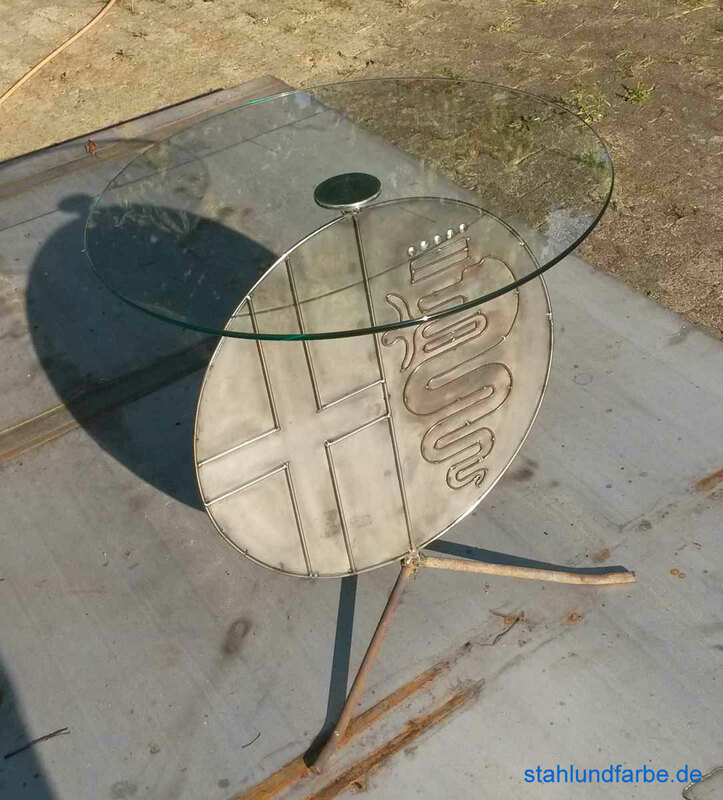 • Contract work "Alfa Romeo Logo design glass table finished". 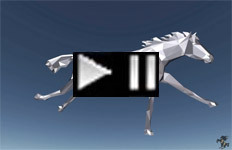 • Development of 3D designs for 3D models of steel palm trees with racing camel and jockey". 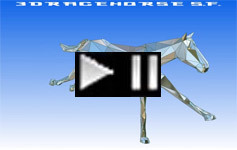 Project study 3D CAD designs for 3D models of steel palm trees with racing camel and jockey. 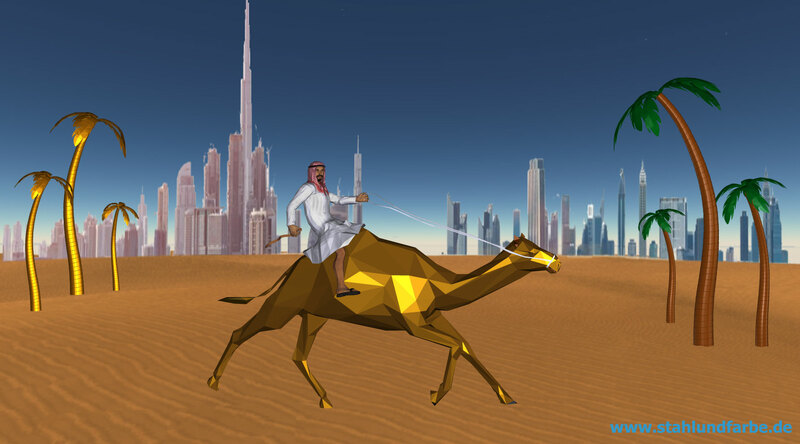 • Project study 3D CAD designs for 3D models Golden Camel Race in Dubai with abstract steel palms "Racecamel". 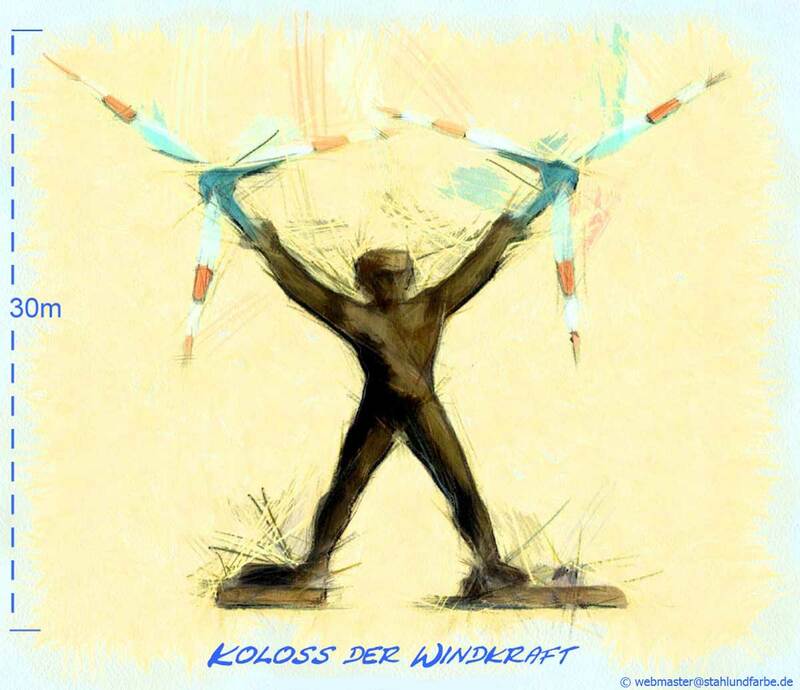 • Development of a windmill steel sculpture "Windmill colossus"
Project study 3D CAD draught sketch colossus of the wind force for an energy corporations. In his stately arms this colossus holds the rotor sheets of the wind power plant. Realisation from 2020. Sketch preview. 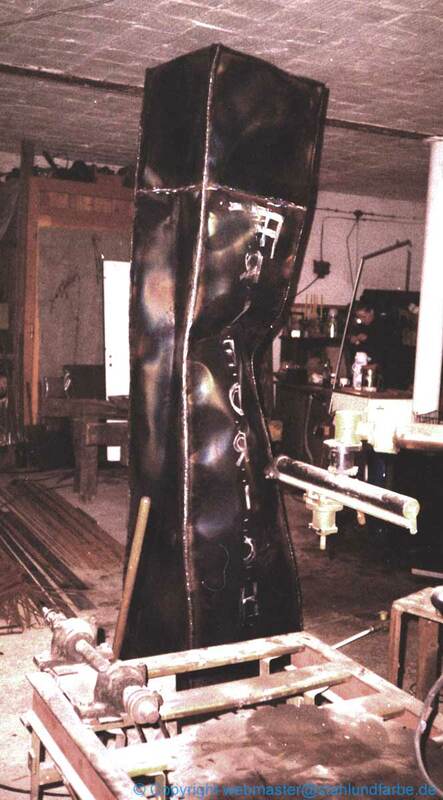 Prototype about the developmental preliminary stage of abstract Rapa Nui steel sculpture. 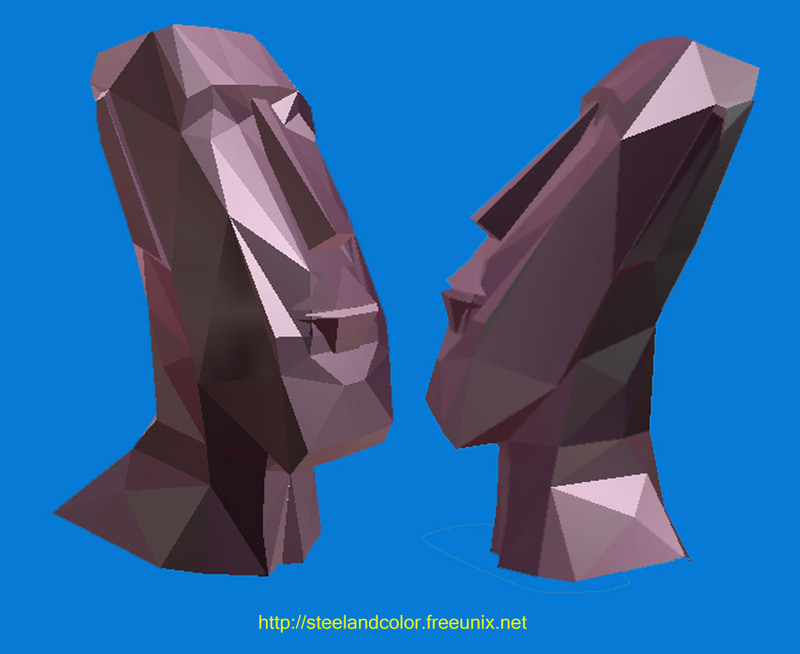 In support on the figures of the Easter islands. The sculpture is joined from single steel segments. The ready sculpture can remain natural (rusty) or are varnished. Different sizes and conducting possibly. 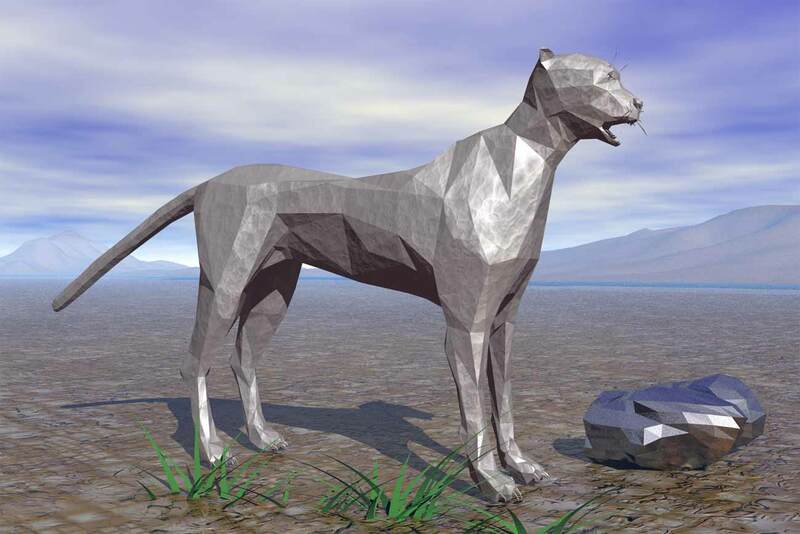 • 3D project studies by steel sculptures with the help of the computer in 3D were modeled. 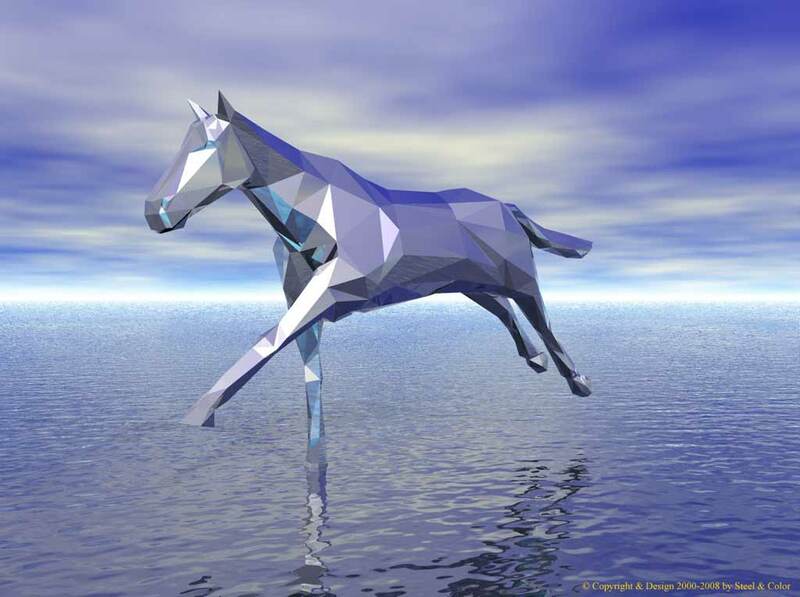 Render image elevation from: Abstract steel horse - raw model rendered. Sketch preview. 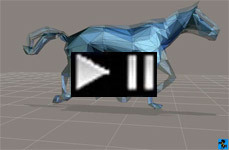 About the developmental preliminary stage of an abstract 3D construction model that was modeled for a full-size horses steel sculpture with the help of the computer. 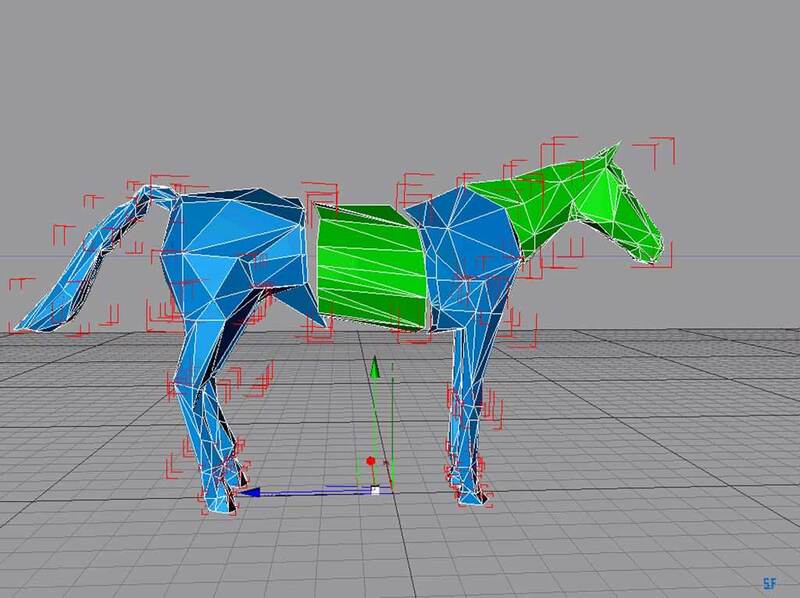 In the unfolding consisted this CAD (Computer Aided Design) - horse model from approx. 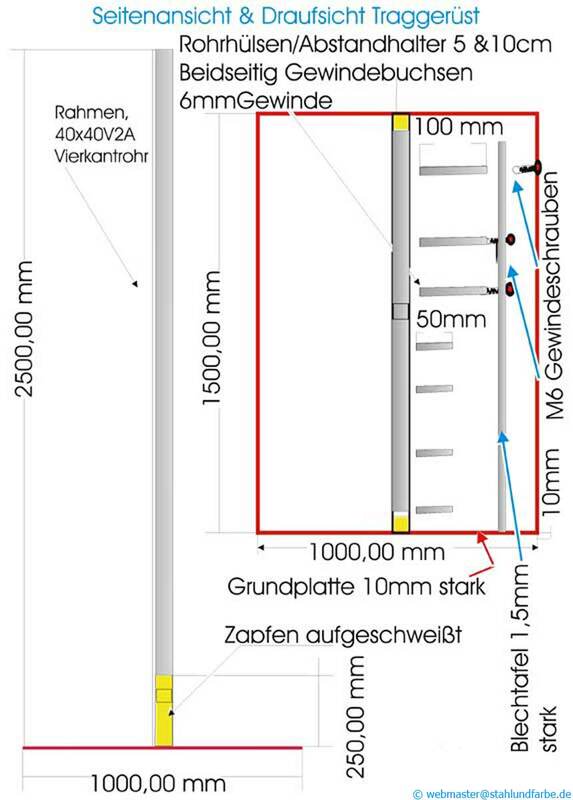 1000 metal sheet pieces (with the following 3D sculptures could the number of the metal sheet pieces according to detailed accuracy and conducting in each case vary) which are cut to fit by a CNC (Computerized Numerical Control) computer file by laser. During the cutting to size with the laser the single metal sheet parts are numbered serially by means of laser engraving of her affiliation. 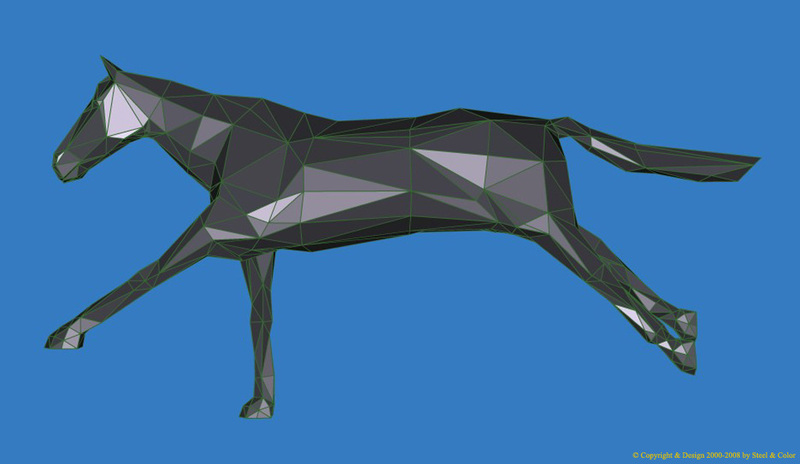 With the help of one Skeletal substructure the precast components are welded in segments to the horse sculpture. 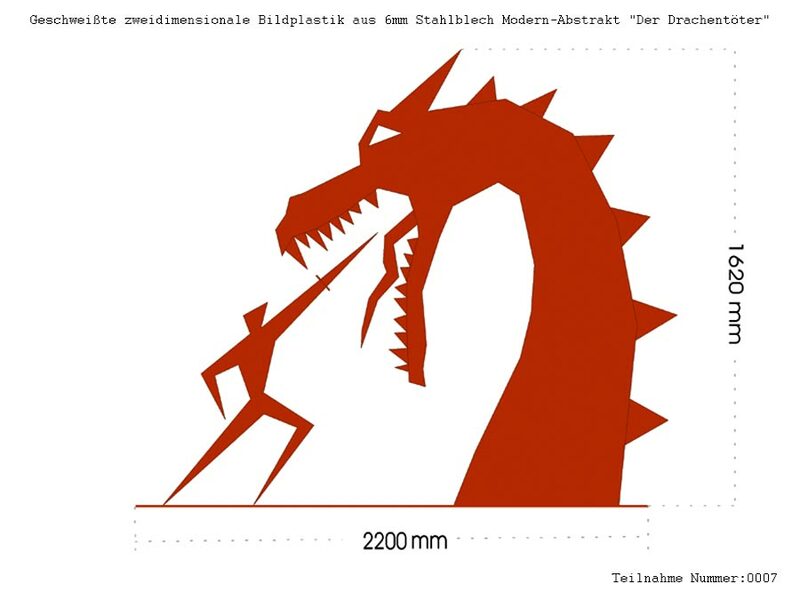 Besides, material choice and scale ratio can vary. 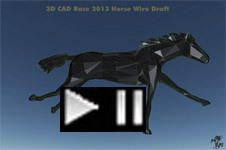 Render image of sketch preview about the developmental preliminary stage of abstract 3D prototype of construction model for a full-size racing horse Stahlskulptur.Render image of sketch preview about the developmental preliminary stage of abstract 3D prototype of construction model for a full-size racing horse Stahlskulptur. 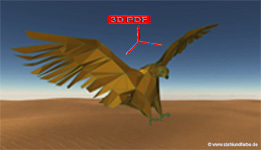 Acrobat 3D PDF model.exe. Click on the images for the download. 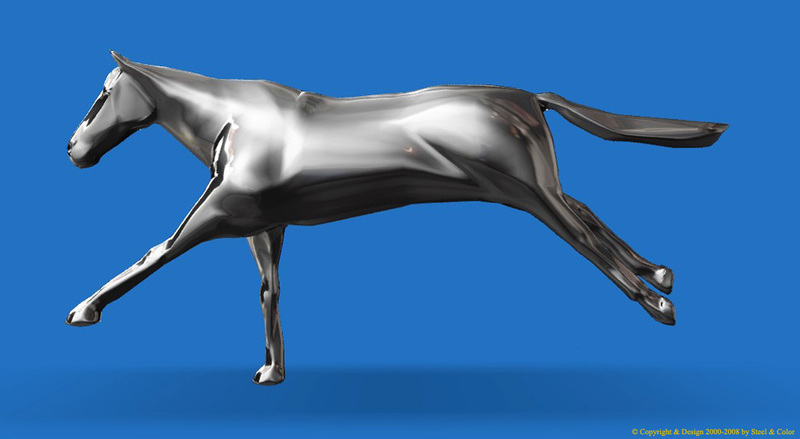 Sketch preview prototype about the developmental preliminary stage of an abstract construction model for a full-size racing horse steel sculpture. Acrobat Reader version X must be pre-installed to be able to contemplates 3D object. 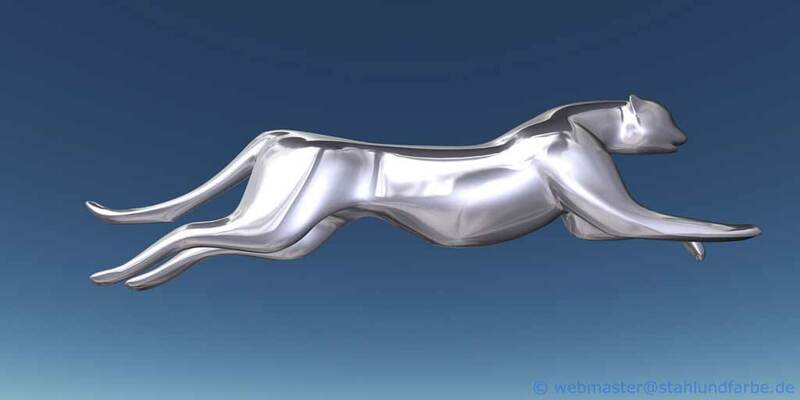 Project study prototype 3D CAD abstract steel racehorse 2013.
render image of sketch preview about the developmental preliminary stage of abstract 3D prototype of construction model for a full-size racing horse steel sculpture with Jockey. 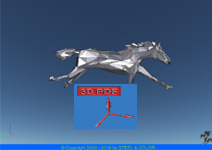 Acrobat 3D PDF model.exe. Click on the images for the download. 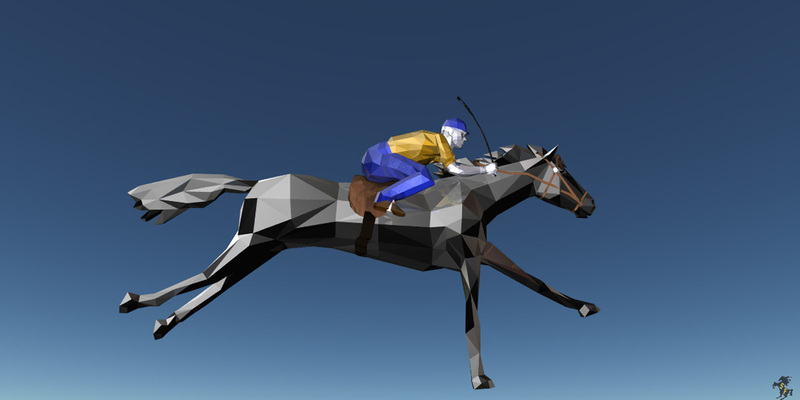 Sketch preview prototype about the developmental preliminary stage of an abstract construction model for a full-size racing horse with Jockey rider in 2015. Steel sculpture. Acrobat Reader version X must be pre-installed to be able to contemplates 3D object. 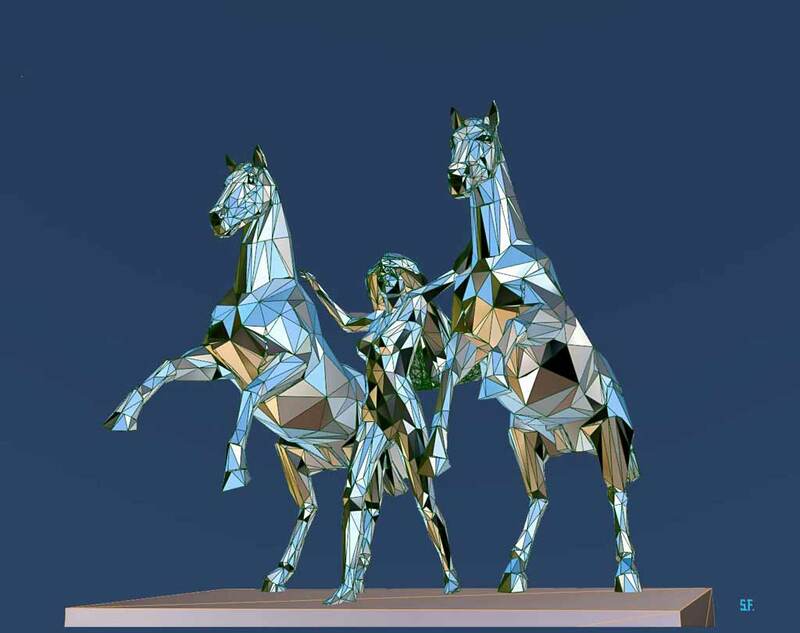 Render image of sketch preview about the developmental preliminary stage of abstract 3D prototype of construction model for full-size rising horses steel sculpture. 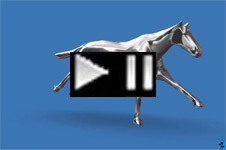 Acrobat 3D CAD PDF model.exe. 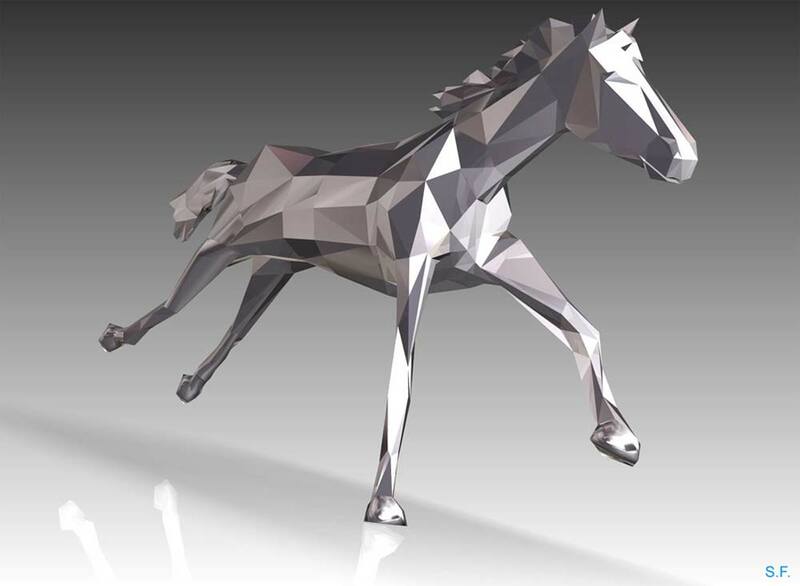 Render image of project study prototype 3D CAD abstracts rising steel horses steel sculptures 2015. 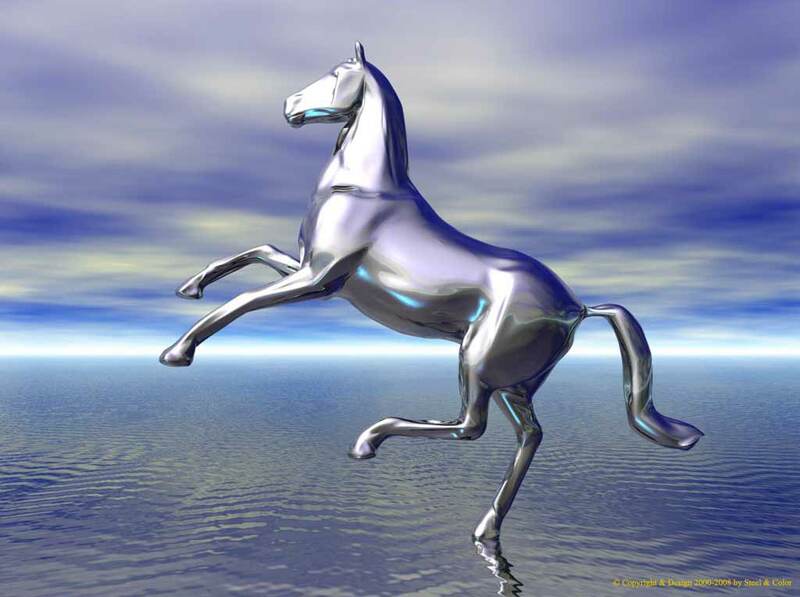 We are working also at models for a life-size unicorn and a winged horse - Pegasus. 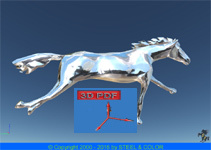 Acrobat 3D PDF model.exe. Click on the images for the download. 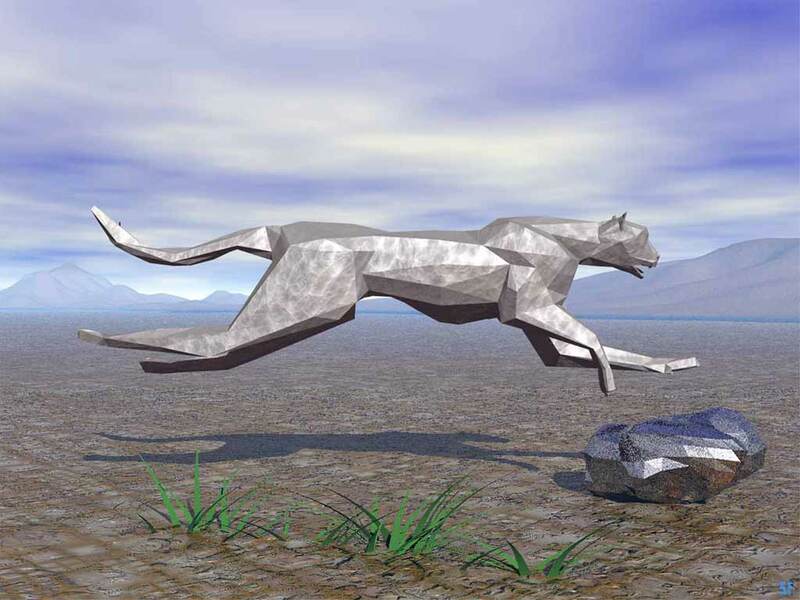 Sketch preview prototype about the developmental preliminary stage of an abstract construction model for a full-size abstract running Jaguar Cheetah in 2012 steel sculpture. Acrobat Reader version X must be pre-installed to be able to contemplates 3D object. 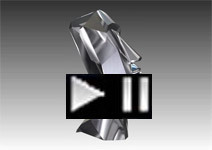 Acrobat 3D CAD PDF model.exe. Click on the images for the download. 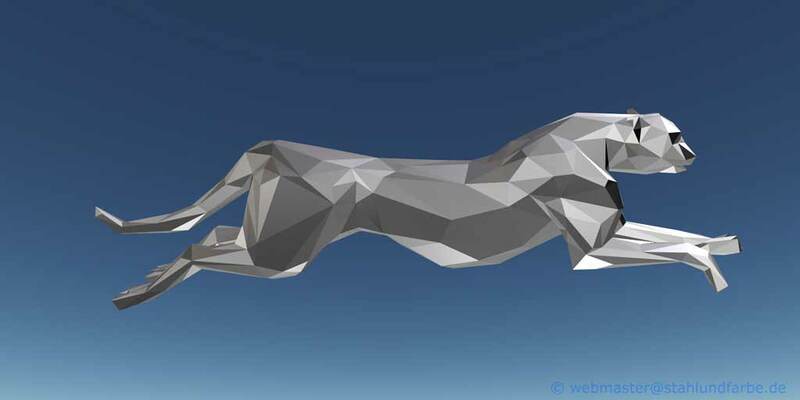 Sketch preview prototype about the developmental preliminary stage of an abstract construction model for a full-size abstract running Jaguar Cheetah in 2015 steel sculpture. Acrobat Reader version X must be pre-installed to be able to contemplates 3D object.to. 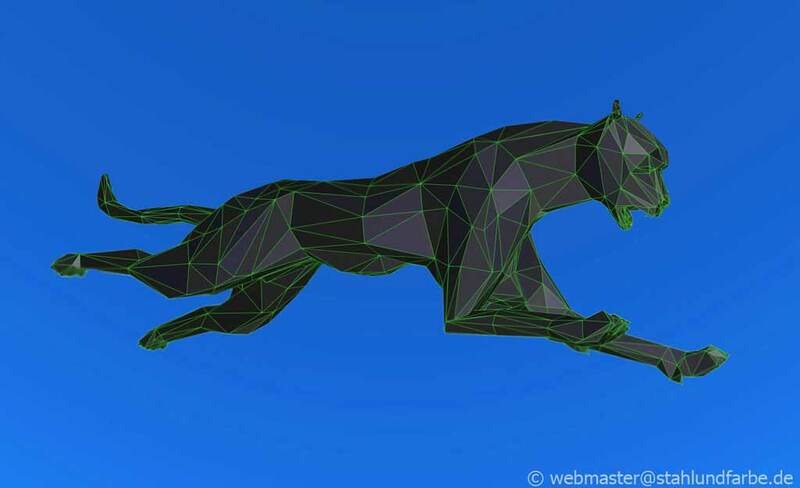 Render image of sketch preview about the developmental preliminary stage of abstract 3D prototype of construction model for full-size Jaguar - Cheetah steel sculpture. Render image of sketch preview about the developmental preliminary stage of abstract 3D prototype construction model for overlife-size Falcon steel sculpture. Click on the images for the download. Sketch preview prototype about the developmental preliminary stage of an abstract construction model for overlife-size Falcon steel sculpture. Acrobat Reader version X must be pre-installed to be able to contemplates 3D object. Video: Octahedron 3D CAD by S.F. Render Illustration. 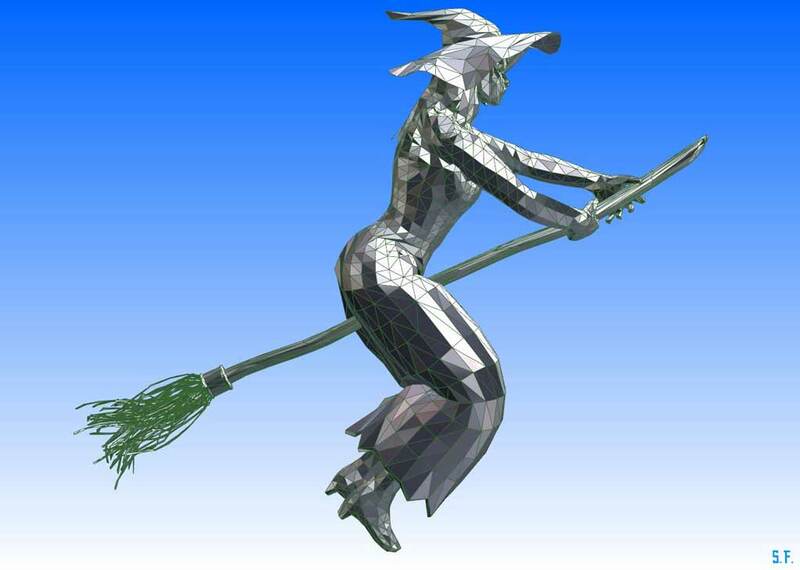 Wireframe project study prototype 3D CAD witch on broom steel sculpture 2014. Render Illustration. 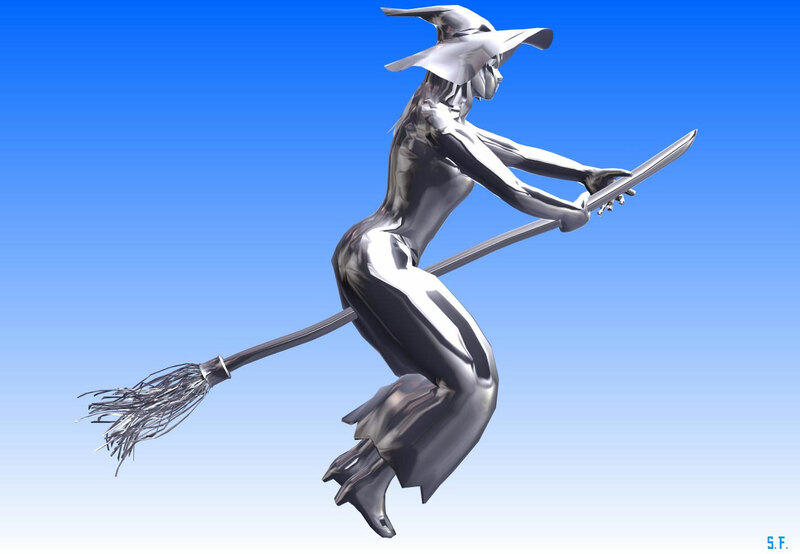 Finish project study prototype 3D CAD witch on broom steel sculpture 2014. 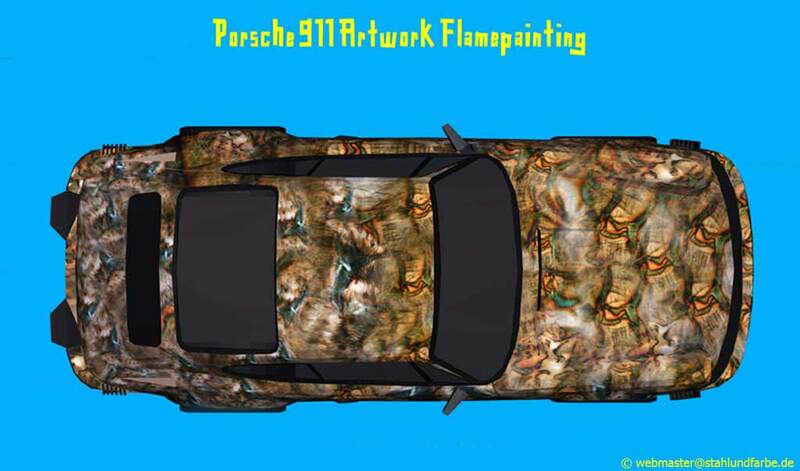 Project study prototype 3D CAD Porsche 911 Artwork Flamepainting with the flame heating on sheet steel bodywork. 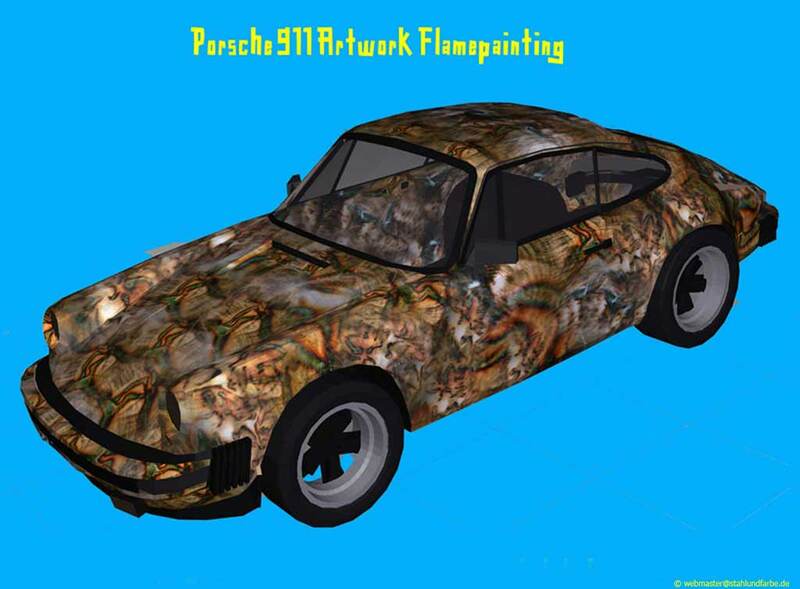 Draught for a flame painting - Porsche 911. By means of burner flame will partially ground on him sheet steel the annealing colours angrily. 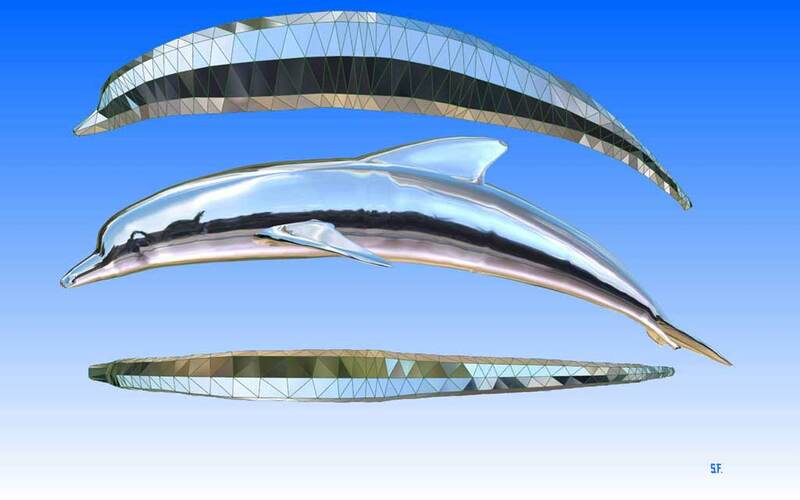 3D steel dolphin "Blow up"
Render images. 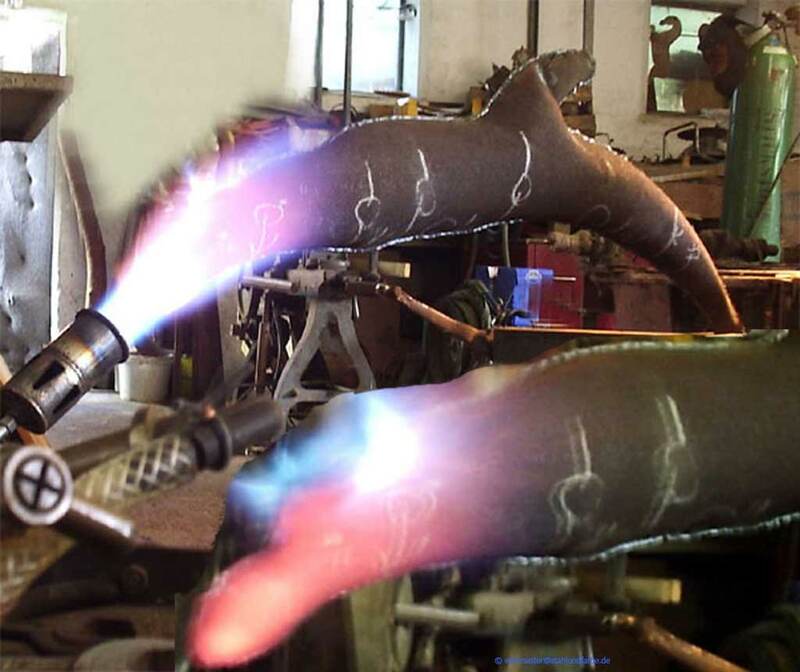 3D steel dolphin Blow Up. 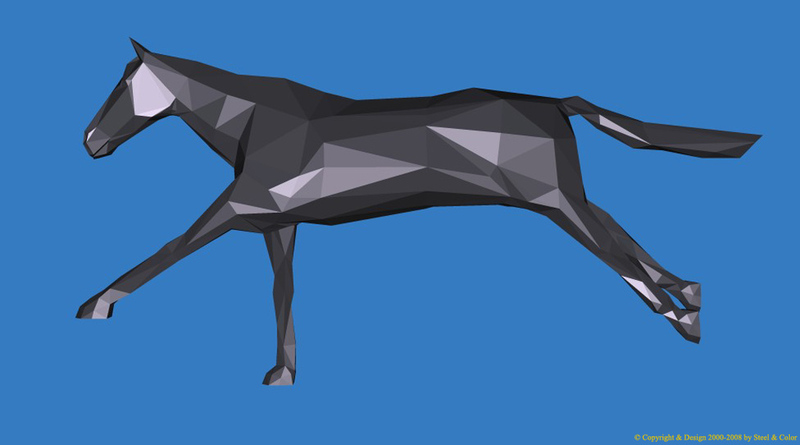 Low Poly Mesh virtually blown up. Steel dolphin Blow up. 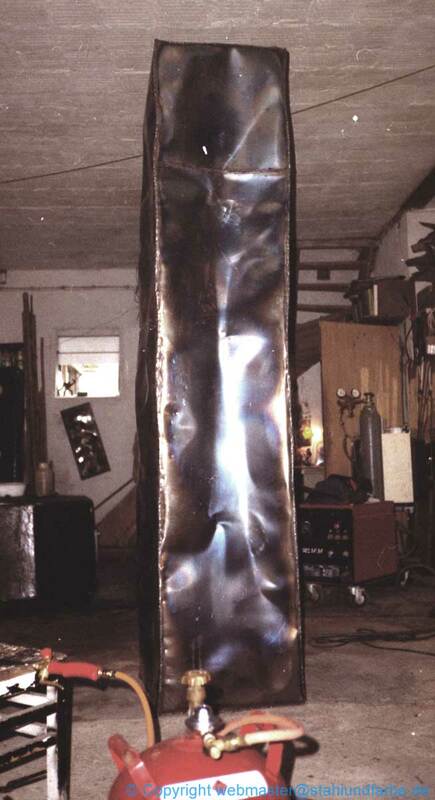 Extrusion of the plate hollow body under atmospheric pressure with the flame heating in the art studio. 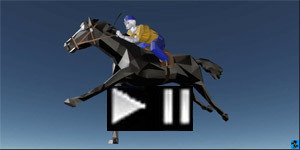 Render images. 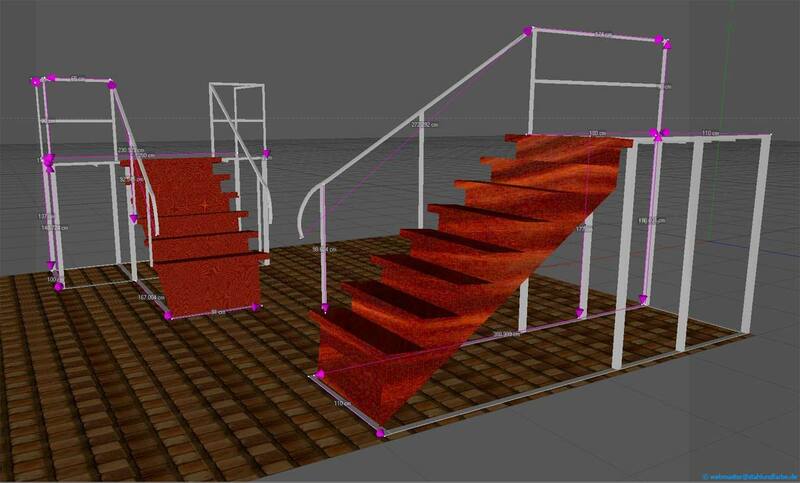 3D CAD architect's plan stairs stages self-supporting, for our gallery. In 2016. Render Illustration. 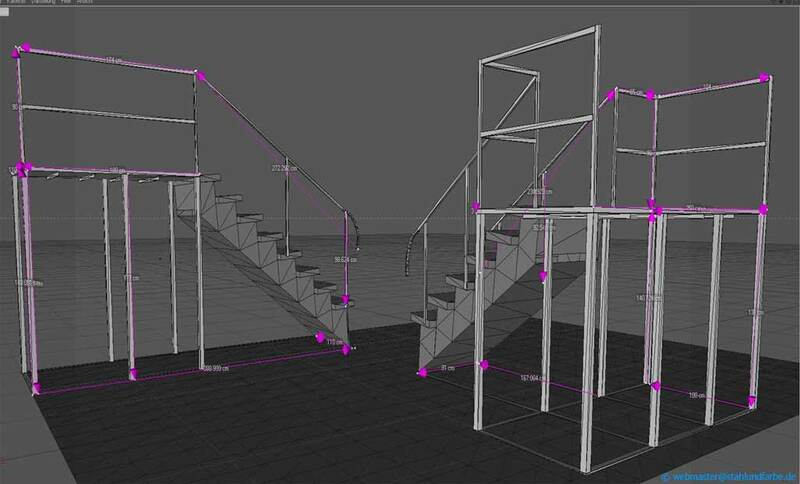 3D CAD architect's plan stairs stages self-supporting, for our gallery. In 2016. S.F. 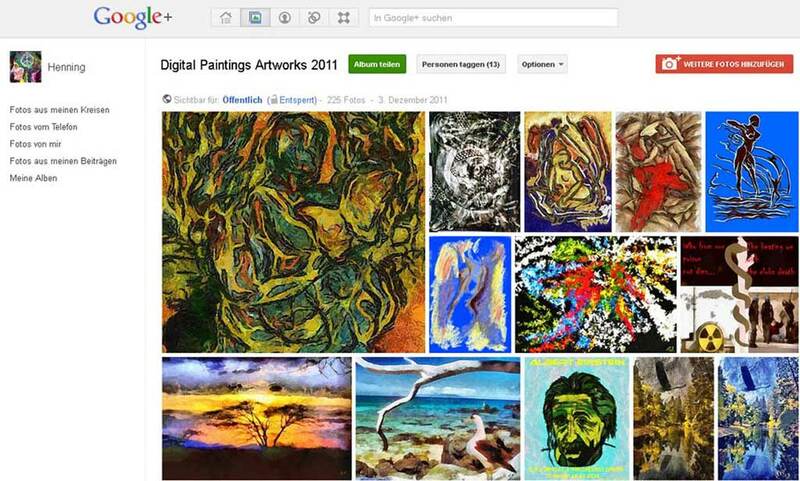 Digital Paintings Artworks 2011 Gallery Google+. 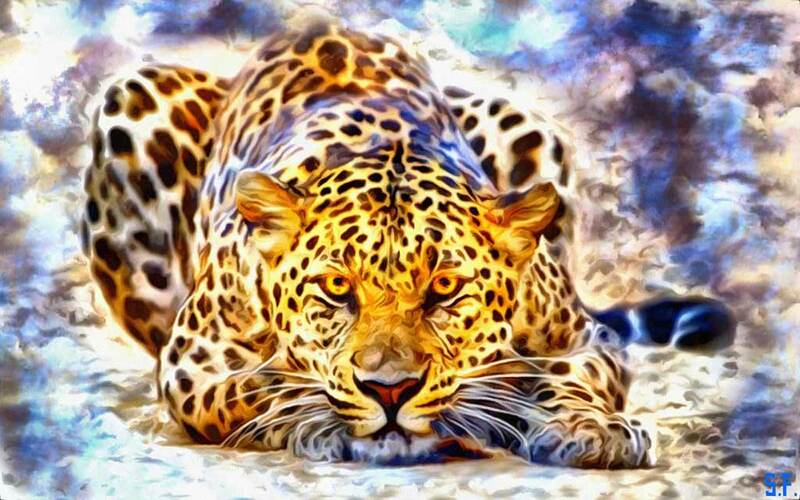 Digital painting on the computer. 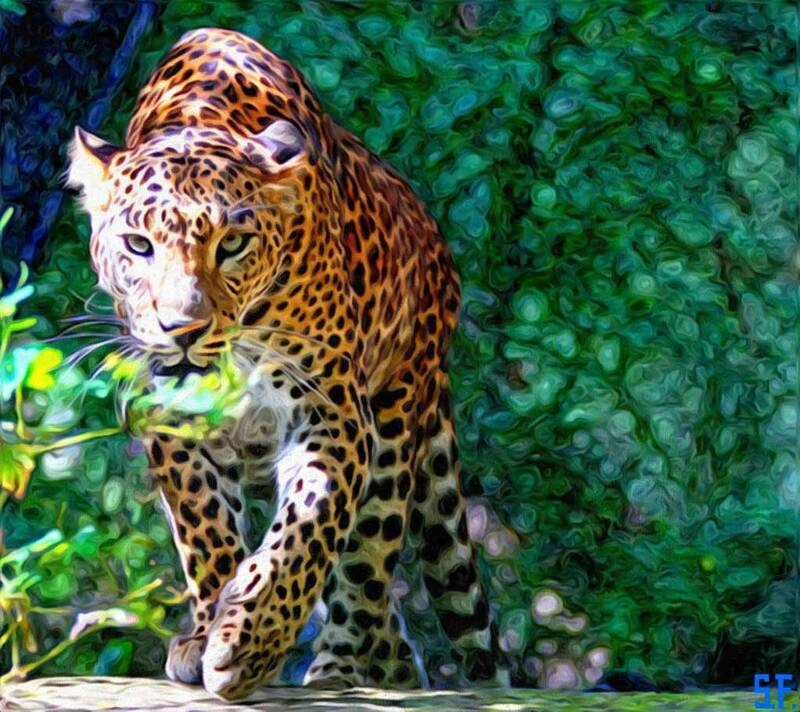 Photomontages digitally of painted images as motifs for the poster expression on canvas. As a reasonable subsoil, basis, for postpainting with authentic oil paint. 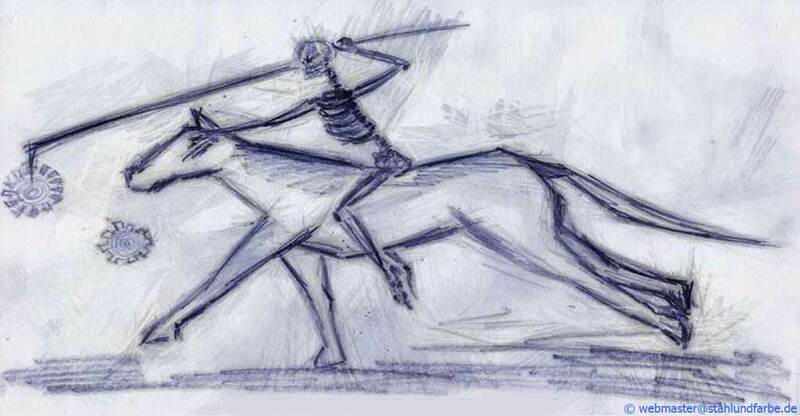 • project study scheme "Progress"
An abstract steel racing horse dashes after a cogwheel floating before him, ridden by a discus thrower in skeletal form who flings his cogwheel of himself to intervene in the gear of the progress. Symbolism for the thoughtless technocratic progress. Already in 1992 on the T.U.N. We presented environmental fair, in Luneburg on this subject the installation: Progress. Creation of outside objects. 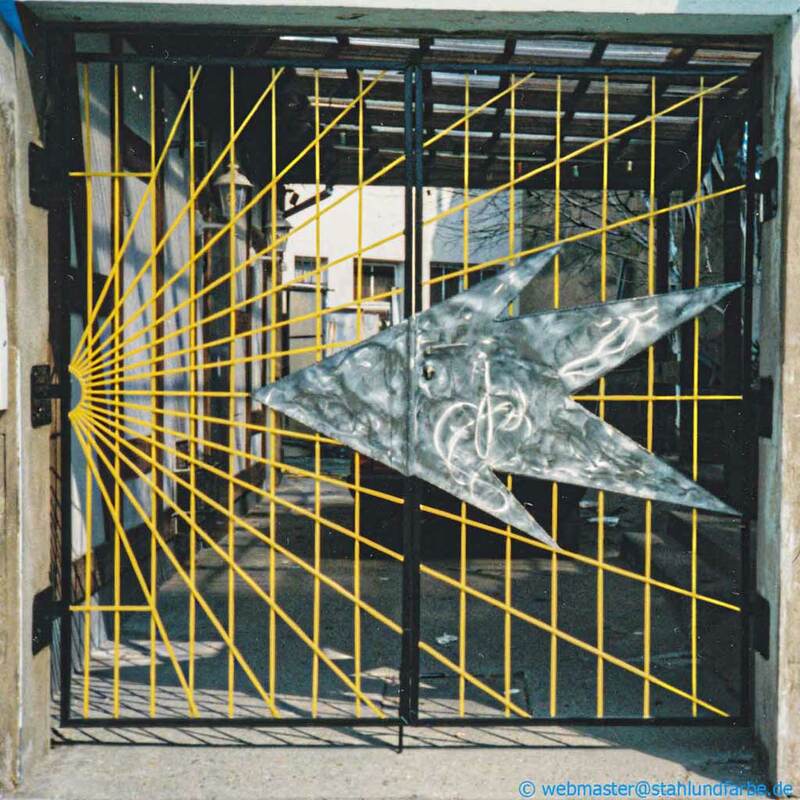 Steel art, steel sculpture duple swing geometrical steel gate: Arrow. in 1997 for the restaurant channel Uelzen. Made from steel pipe, square steel and sheet steel, partially ground and varnishes. Draught for the outside facade and the forecourt creation of a health food hotel in the resin. 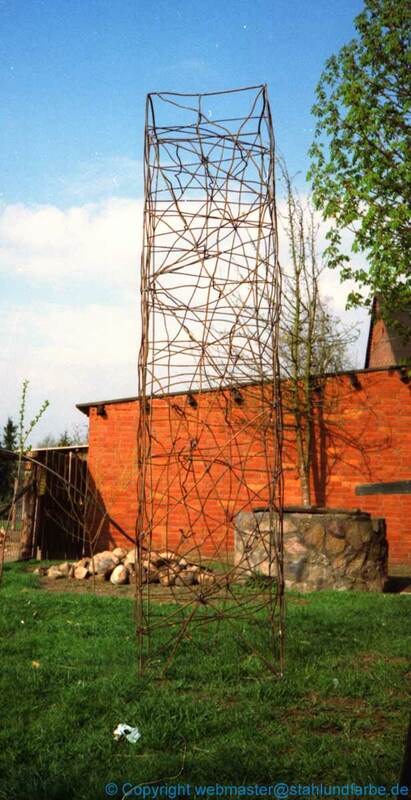 Monolith steel column - Friedrich Wilhelm Ziesenis Stieg, castle village. The first draught sketch and manufacturing in different development stages. In 1997. The column is produced of sheet steels, to a hollow body welded and with air pressure and vacuum modeled. The underframe is constructed of round iron. 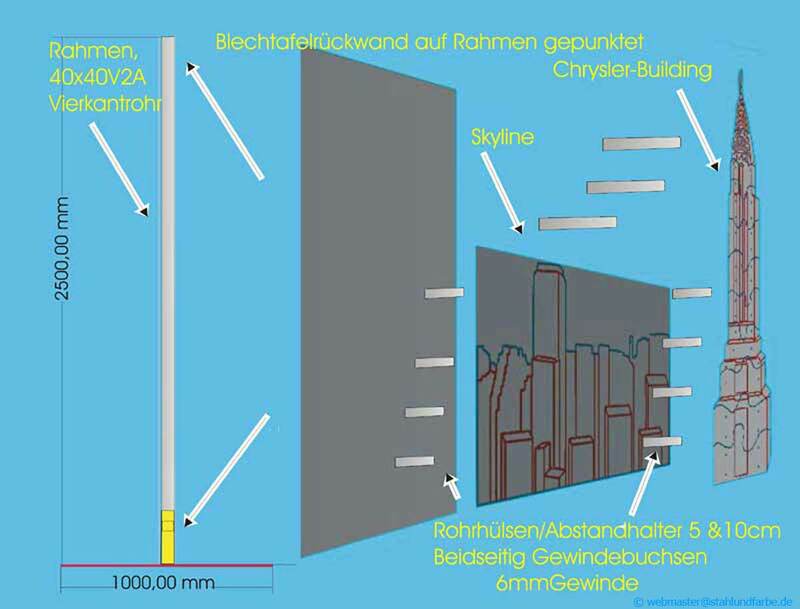 To the illustration of the foreign rust problem with stainless steel screw connections, we developed the idea, this by direct comparison two to illustrate of two-dimensional images. (Removes leant to a so-called diorama). The images should be used on the Wera exhibition stand. 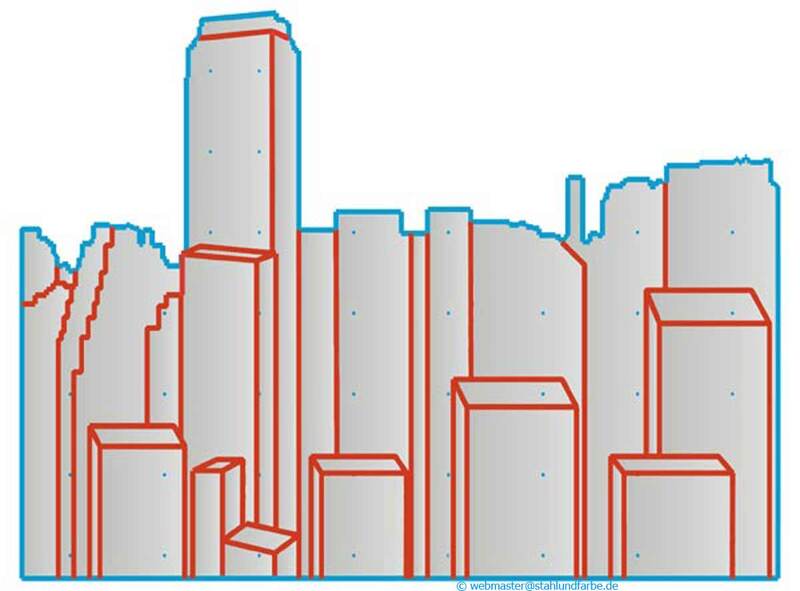 The objects, planned in the dimensions 150 cm of B x 250 cm of H, have to do identical illustrations of the skyline Manhattan, with in the representation superficial motif of the Chrysler Building, contain. Material: Stainless steel (V2A, V4A). 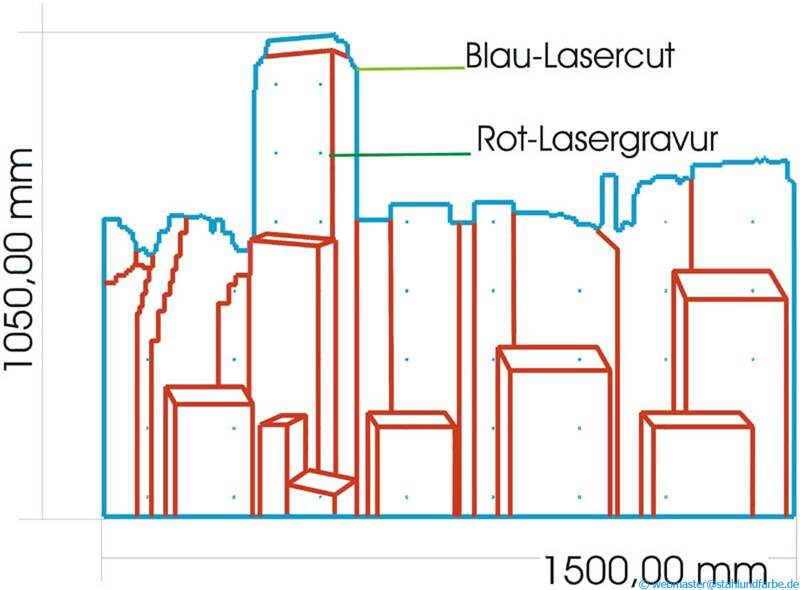 On the total area should be shown in two levels to achieve depth effect by indirect lighting cryptic, about 2-5 cm in the distance to the base, the skyline and on distance of about 10 cm, also to the achievement of a depth effect with lighting, the illustration of the Chrysler Building. (Light-emitting diodes, luminous means.) All motifs should be screwed on by means of various screws. One of the objects that is screwed with customary tools, have to go by means of a spray equipment, salted waters about the image work separate to obtain thereby an acceleration of the rust education. (The "bad" images). With the second object (the "good" images) the superficial motif of the Chrysler Building should consist of several sections (jigsaw puzzle-like) to be able to be apart-builded during the fair over and over again compositely, or. For this action the fair visitor is welcome, otherwise the artist will "work" on it. It should be started by the various screws, possibly many different tools. The objects should be constructed certainly about situation and self-supporting. In addition, a protective suspension is planned if necessary for the image works of the ceiling of the fair hall. 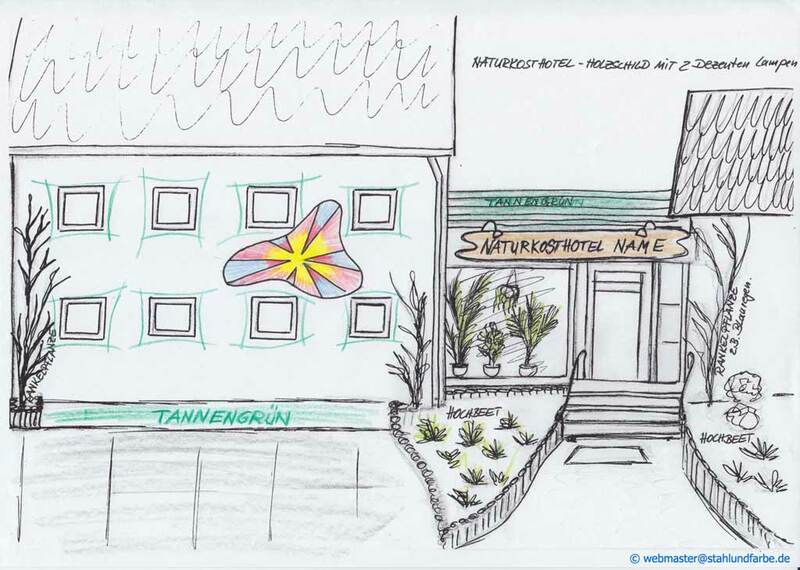 Draught sketch for a piece of art on the occasion of the reorganisation of the place before the local authority Saint Georgen with upper mountain. Two-dimensional image plastic cut to fit, from sheet steel Saint 37 and welded. In 2008. 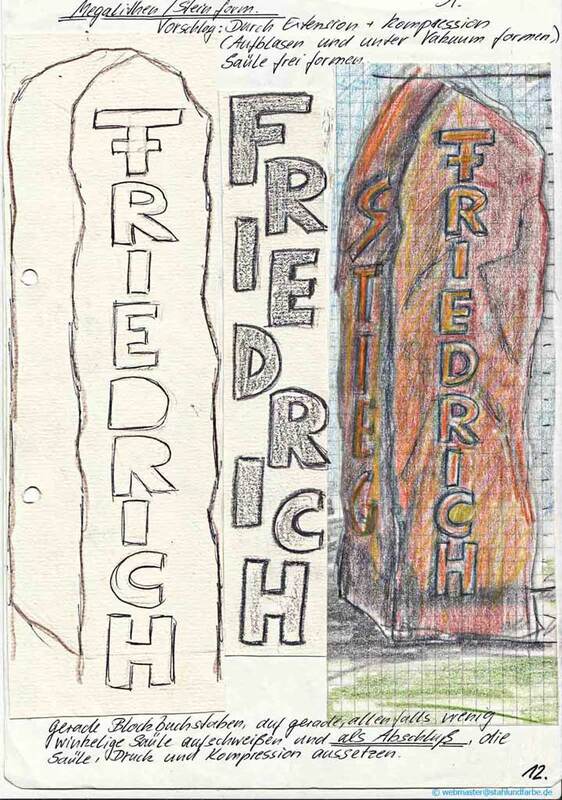 With the declarations to the words: demanding supplies and exceptional economics resorts the artist first onto one verbal journey, in order for itself these definitions deciphering. Economics, greek the house, the budgetary concerning; exceptional Lat. extraordinary, aberrantly. Interrogating offers in a extraordinary House? Then what is art and what makes a artist out? Artist in the world today be, is called many professions in a body to unify. Manufacturers, manager, agent in the discharge of an obligation, initiator, financial accountant, production worker, worker, clerk, chief, advertizing technical adviser, marketing-researcher, navigator, business counselor, jurisprudent, controller, key-Accounter, Director of creative, analyst, meta optimizer, content finder, market researcher, Programmer. For all that shall he still sophisticated, interesting, extroverted, Collegiales, inspirationales and a better-looking, droller hominid Its. 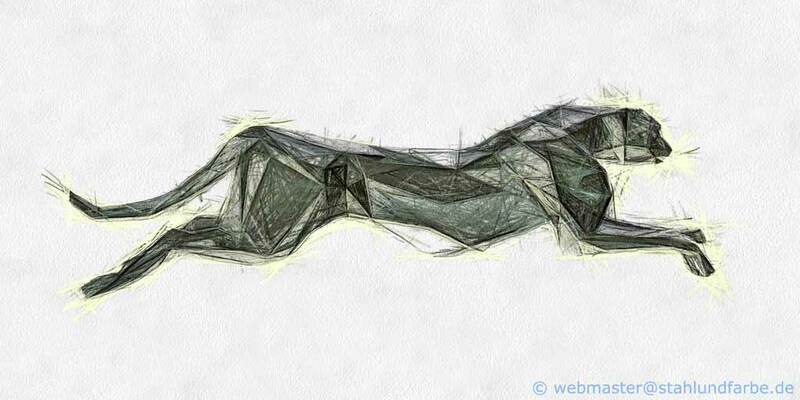 Whether the artist now a purer altruist or egoist is, comes only on the viewing angle at. Indicate we it in that location when altruistic egoists. Each artist has his whole life long with exceptional economics be by way of doing. Sells he but time of life themselves produced branded article, the until actual sale or through right grant imaginary profit margins presents. Economics means also, from as little resources as possible, as much as possible, to establish. Whether with the manufacturing contemporary art about market's or planned economy deals, yields itself only through the demand. The topic: Interrogating offers provides the artist before even those mountain, before even that legendarily sisyphus confessed has, about in the eternal fight always the same stone on the mountain scrolling and after arrival to look at, like this itself the efforts opposed and contrary to each logic, the predetermined route of taking. In contrast to sisyphus, that the might of dead broke, - at least for a spell -, wants the artist through his work deathlessness obtain. In its creativity is the artist altruist, in his thought egoist. So long as he creative is, impressed him a spiritual uplift. In the breaks he is a human..
Interrogating proposals. Sounds like the riddle of the sphinx, existence going past traveller asked riddles like Oedipus. Eureka! A mountain! Interrogating offers! If the inquiry implies the offer or does solution behave of the riddle exactly differently around? The absurdity of the situation equals one essay of Albert Camus according to the myth of the sisyphus. The sensory adversity of the world and the longing of the human after sense. With Camus beginning and beat of the life-work stands to the acquisition of the free consciousness in the foreground. With it we are again with artist arrived at. Has he got now over the words access to the items: Supplicatoryes, offer, exceptionales, economy, achieved? Possible meadow he is still arrested in the market economy, where only To facts count, what, when, is produced how and for whom. Has he got in the meantime be awareness achieved? Shout we once again: Eureka! and adjust them our evolved concept for interrogating offers vor. Manufacturing: "Opposite" Steel sculpture Opposite. Two steel sheet hollow bodies are inflated by air pressure modelling and afterwards with subpressure / vacuum crumples. They should show a mountain formation with enormously steep abyss in between. On the mountain formation a force measuring of the opponents finds in Form of a tug of war instead of, which by cut open screwing little men and a tearing steel rope is shown. For the viewer is by the upon spliced steel rope clearly to recognise that the pull test stands shortly before the end, what also on to see to both sides by the falling off screwing little men is. The steel sheet hollow body plastic universal symbolises by the both with each other to competing parties, to itself towards of the abyss in a force measuring consider, the condition of a pull test. This Relative strength from Exceptional - economy. If no consideration is shown for the compensating justice by the reason, the cancel threatens one or just both of the opponents. The steel sheet hollow body plastic universal has to go on account of her symbolism and ambivalence are used for a digital video projector projection in the conforming to contrasts are exchanged arbitrarily.